What Grows on an old Birch Tree? 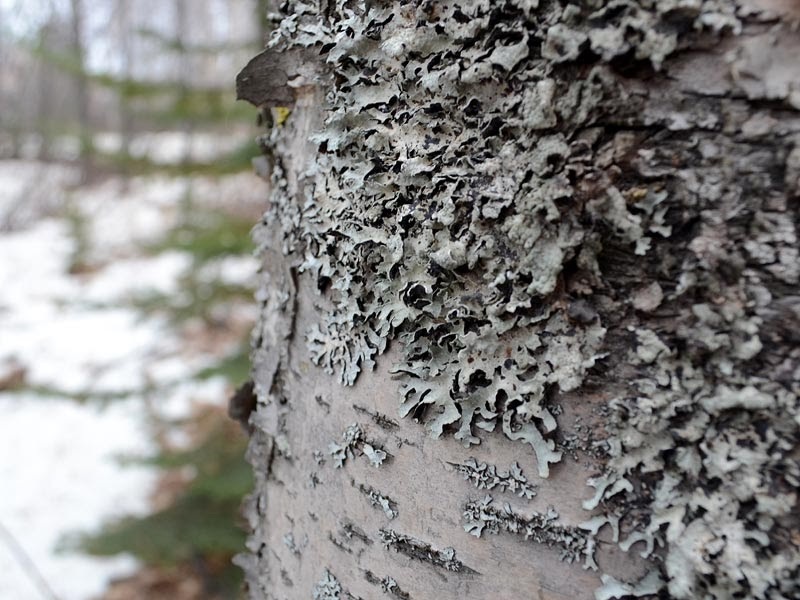 As if the glory of weathered birch bark peeling off in strips of parchment and tissue paper isn't enough, older birch trees accumulate colonies of lichens as well. Lichens are interesting - neither plant nor animal, they are a symbiotic blend of algae and fungi. Lichens are able to make their own food by photosynthesis, so they aren't parasites and don't harm the tree. And the textures! Texture! Subtle colors!!!!!!!! What if you did an entire month of birch? Thanks, Barbara, now there's a challenge. So, the theme for December is "Birches and Their Neighbors." Thank you for solidifying it! Meanwhile, yes, the colors of the lichens are so subtle, and the textures so bold, they are lovely to look at.